I was going through my email the other day and found an email from one of my clients who had previously told me that they would be on vacation this week. I even recalled that they were going out of the country. I was a little shocked to get the email with a list of revisions that they wanted me to work on. It got me to wondering, do business owners ever really take vacations from their Toronto office space? In this case the answer is obviously no. 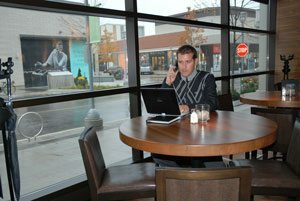 Today, with all the available technology and available high speed internet on almost every corner of the globe, it is quite easy to stay in touch with your Toronto office space. A growing number of people are installing wifi Internet at their cottages, just so they can sit on the deck or dock to use their laptop to stay in touch with their desktop computer at their office space Toronto. Some will travel without their laptop, notebook or netbook, but will hold on tightly to their tablet or smartphone. Then there are the people who do not want to pay heavy roaming fees and will use apps on their smartphones to find free wifi zones or local Internet cafes to work from. While entrepreneurs’ and small business owners are often not able to take long vacations or even short ones, the main reason for taking a vacation is to get away from your office space for rent and get some downtime to refresh. The best advice to those entrepreneurs and small business owners who never really take vacations from their Toronto office space even when they are on vacation, is to regulate and schedule the amount of time and instances when they try to keep up with what is going on back at their office space. Try to spend only 15 minutes in the morning and then if needed, another 15 minutes in the afternoon. This will allow you to enjoy your vacation and be refreshed when you return to your Toronto office space for rent. Now to confess… I will be taking a vacation in August and I will be taking a laptop with me to keep up on my office space Toronto blog.